A short stroll from the Boston waterfront where the 2017 Tall Ships Regatta will be taking place is Faneuil Hall Marketplace, a “must do” for any visitor coming to Sail Boston. History abounds at the Marketplace that sits next to historic Faneuil Hall, also known as the “cradle of liberty” where the seeds of the American Revolution were sown. Mayor Josiah Quincy made his mark on the city by opening a new public market in 1826 to accommodate Boston’s burgeoning population. Faneuil Hall Marketplace features over 100 local shops, national retailers and specialty pushcarts offering a unique selection of hand-crafted jewelry, unique clothing, accessories and New England giftware. Local entrepreneurs include Boston Pewter Company, Geoclassics and L’Attitude Boston Boutique. National retailers include Sephora, Coach and Uniqlo. 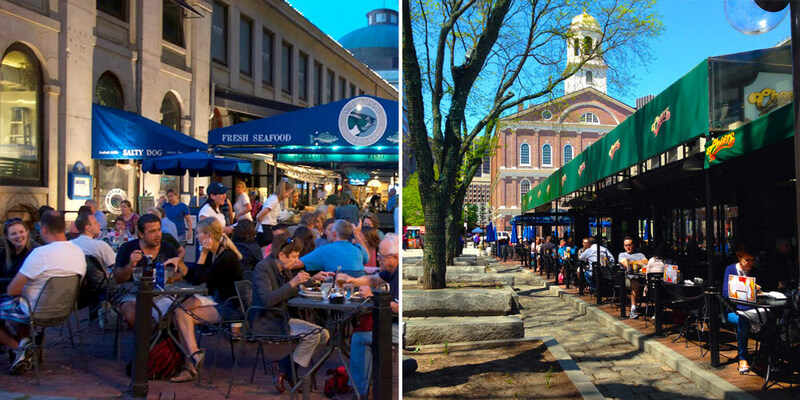 The Quincy Market Food Colonnade serves thousands of visitors every day with an eclectic mix of food vendors that offer an array of international cuisines, from New England staples such as clam chowder and lobster rolls to Mexican, Italian, Japanese, and Middle Eastern delicacies. In addition, 12 restaurants and outdoor cafes offer the perfect spot to sit for awhile and enjoy a meal. Faneuil Hall Marketplace also offers FREE outdoor activities suitable for every member of the family. 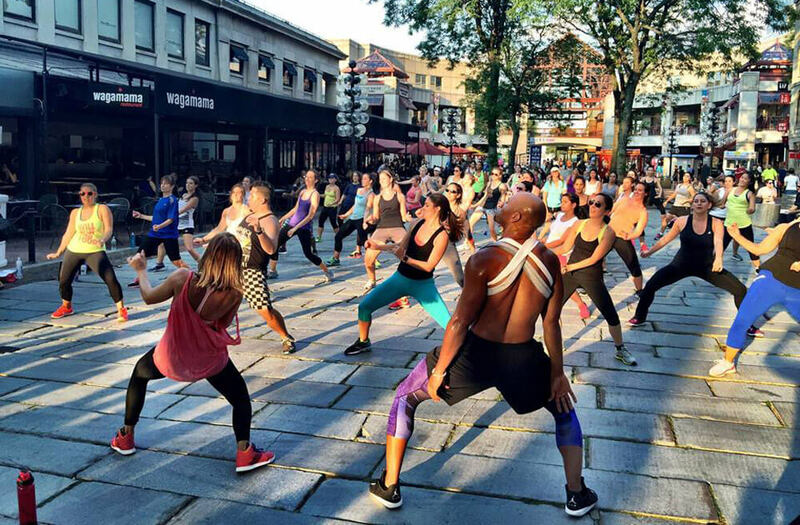 From outdoor chess and ping pong, to historic walking tours of Quincy Market, to free fitness classes to get your heart rate going that include BollyX, Cardio Dance, Warrior Sculpt Yoga, and Pound® lead by the leading fitness instructors in Boston. The outdoor programming is called “Summer Sampler” because there truly are a vast sample of programs and activities that will fit everyone’s style and abilities. Take a class, then enjoy a beverage and bite to eat from one of the Marketplace’s pubs or restaurants. Bring your friends and make Faneuil Hall Marketplace your “go to” spot for get-togethers with friends during Sail Boston celebrations. 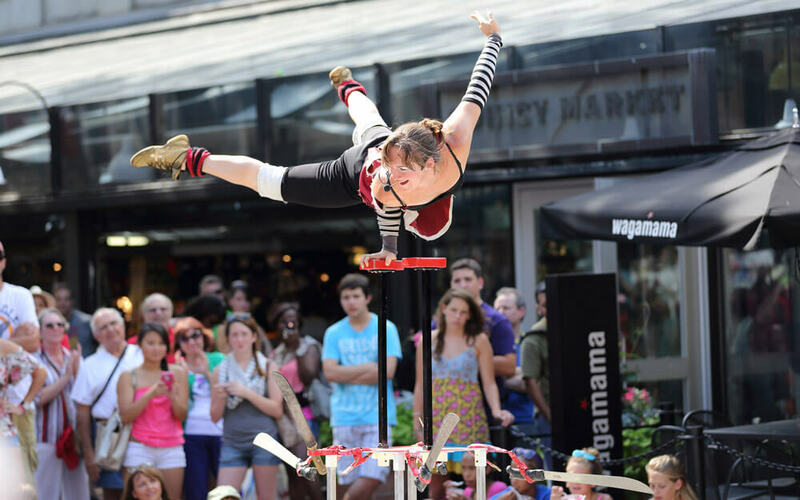 Spend more time at Faneuil Hall Marketplace to see the world-famous Street Performer program. Nowhere else in Boston can you observe the talent and variety of street performers than at Faneuil Hall Marketplace. A tradition that began when the Marketplace reopened after renovations in 1976, the street performers will be razzling and dazzling crowds throughout the Sail Boston week. The Marketplace is the perfect location for outdoor performances with its pedestrian friendly, car-free venue that has everything you need for a fun day in the City with friends and family who are visiting Sail Boston: live performances, shops featuring unique local items as well as well-known international brands, a plethora of dining options in the Quincy Market Food Colonnade or enjoy a leisurely meal while dining at an outdoor patio and have the best seat in the house to watch the street performers from your table. New performers have just been added to the roster of acrobats, jugglers, escape artists, magicians, and musicians. For more information and the latest updates on what’s happening at Faneuil Hall please visit faneuilhallmarketplace.com or faneuilhallmarketplaceboston.com.